The small Jaboticaba tree on the right was photographed in June. It was planted in early July of the previous year. July would normally seem to be a hazardous time to plant a tree, but it worked out well because even though it was hot it was also very humid. Hot dry weather is generally much harder on tropical plants than hot humid weather. In fact, many tropical plants and citrus in the Phoenix area have a spurt of growth in July when the humidity rises. This Jaboticaba was ordered from Florida by mail. Fortunately, my front courtyard faces north so the tree, in its box, was waiting in the shade after they dropped it off. If it had been sitting in the summer sun for even half an hour it might not have made it. Ordering plants in the summer is always risky so everything has to be considered when doing so. This jaboticaba tree is growing on the north side of a 6 foot block wall (4 ft. away) and on the east side of a large pine tree at its drip line (6 ft. away), so it receives afternoon shade and protection from hot southern exposure. 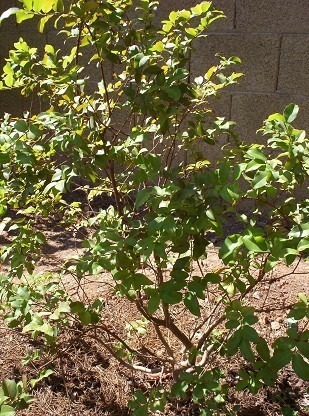 Jaboticaba trees grow well in Phoenix when they receive afternoon shade and sufficient water. They are slow growing and are salt sensitive so only mild organic fertilizers should be applied to them. Being as hardy as citrus, jaboticabas are not susceptible to freeze damage in the Phoenix area. Jaboticaba fruit are reported to be delicious. However, the tree can take many years to fruit so only plant it if you are willing to wait 5 plus years. I have had no fruit on mine yet. Jaboticaba trees need afternoon shade. Other than that they take the heat well. Being hardy to 24 F., similar to citrus, jaboticaba trees can take all but the most extreme Phoenix weather without problems. supply some nutrients. Do not fertilize the newly planted tree until it has been vigorously growing for a couple of months. Jaboticabas do well on a grass watering schedule. The natural habitat of this tree is very wet, so it is actually very difficult to overwater it. In the summer in Phoenix, giving the tree a good soak between scheduled waterings can be beneficial. Jaboticabas do well with monthly light applications of Alaska Fish Emulsion 5-1-1 during warm and hot weather. Stronger fertilizers and fertilizers containing more potassium and phosphorus tend to burn them. A thin layer of compost around the tree's base will help keep the soil moist and provide additional nutrients. Jaboticabas are grown from seed and from leafy cuttings.